PROVIDENCE, R.I. — The military plans to examine hundreds of sites nationwide to determine whether chemicals from foam used to fight fires have contaminated groundwater and spread to drinking water, the Defense Department said. The checks are planned for 664 sites where the military has conducted fire or crash training, military officials told The Associated Press this week. Since December, tests have been carried out at 28 naval sites in mostly coastal areas. Drinking water at a landing field in Virginia and the groundwater at another site in New Jersey have been found to contain levels above the guidance given by the federal Environmental Protection Agency, the Navy said. Results of the other tests have either come up under federally acceptable levels or are pending. The Navy is giving bottled water to its personnel at the Naval Auxiliary Landing Field Fentress in Chesapeake, Virginia, and is testing wells in a nearby rural area after the discovery of perfluorinated chemicals in drinking water, which the federal Agency for Toxic Substances and Disease Registry says may be associated with prostate, kidney and testicular cancer, along with other health issues. A list of the fire and crash training sites where the military is assessing the risk of groundwater contamination from firefighting foam. The Navy found perfluorinated chemicals in the groundwater monitoring wells at Naval Weapons Station Earle in Colts Neck, New Jersey, but not in the drinking water supply. Test results from off-base drinking water wells are expected this month. And several congressmen are raising concerns about the safety of drinking water near two former Navy bases in suburban Philadelphia. 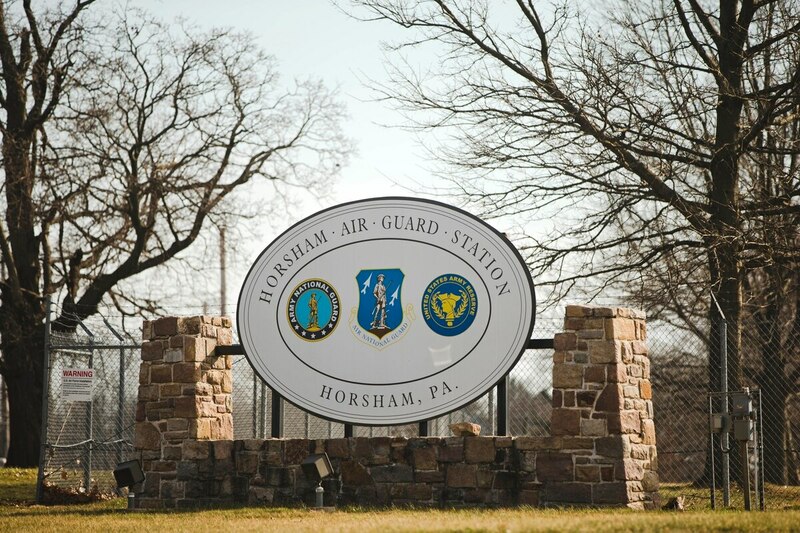 The lawmakers say firefighting foams might be the source of chemicals found in nearly 100 public and private wells near the Naval Air Station Joint Reserve Base Willow Grove and the Naval Air Warfare Center in Warminster. The foam is used where potentially catastrophic fuel fires can occur, such as in a plane crash, because it can rapidly extinguish them. It contains perfluorooctane sulfonate and perfluorooctanoic acid, or PFOS and PFOA, both considered emerging contaminants by the U.S. Environmental Protection Agency. The Defense Department said that until foam without perfluorinated chemicals can be certified for military use, it is removing stocks of it in some places and also trying to prevent any uncontrolled releases during training exercises. 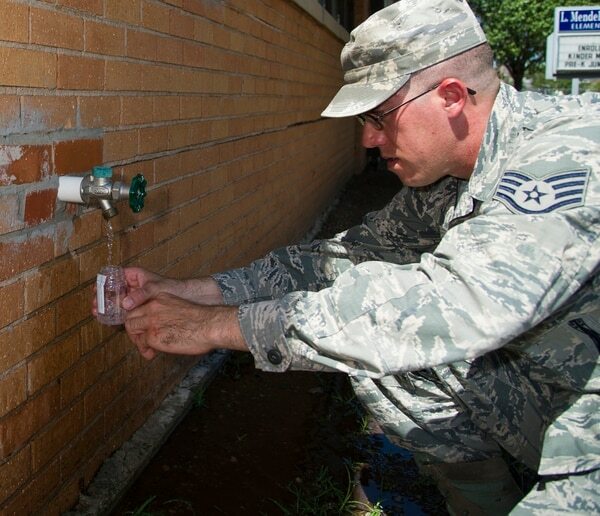 An airman collects a water sample during a routine water sampling in 2013 at Altus Air Force Base, Okla. The military is beginning to assess the risk to groundwater at the training sites not only to determine the extent of contamination, but also to identify any action the Defense Department needs to take, said Lt. Col. Eric D. Badger, a department spokesman. California has the most sites, with 85, followed by Texas, with 57, Florida, with 38, and Alaska and South Carolina, each with 26, according to a list provided to the AP. Each state has at least one site. Knowledge about the chemicals' effects has been evolving, and the EPA does not regulate them. The agency in 2009 issued guidance on the level at which they are considered harmful to health, but it was only an advisory — not a standard that could be legally enforced. The EPA said then that it was assessing the potential risk from short-term exposure through drinking water. It later began studying the health effects from a lifetime of exposure. Those studies remain in progress. The Navy started handing out bottled water in January to about 50 people at the contaminated Virginia site, and it worked with the city to set up a water station for concerned property owners after it found perfluorinated chemicals in on-base drinking water wells above the concentrations in the EPA advisory. The Navy is testing private wells of nearby property owners; those results are due next week. Chris Evans, of the Virginia Department of Environmental Quality, credited the Navy with being proactive but said he's concerned anytime there's a potential threat to human health and the environment. Some states have established their own drinking water and groundwater guidelines for the maximum allowable concentrations of the chemicals; Virginia uses the EPA's. "We'll follow EPA's lead as this develops," Evans said. There's a lot of evolving science around perfluorinated chemicals, said Lawrence Hajna, a spokesman for the New Jersey Department of Environmental Protection. "The more that we hear, the more that we realize that this is a very important health concern," he said.